There are 8 reviews of Pretty. I bought it for my girlfriend a few years ago because it had a cute bag included. It is nothing special , but like its name, it is very pretty, exactly like the girl who now is my wife. I really love when she wears it because it irradiates her cuteness and innocence. Very pleasant scent, but nothing unique. On her skin, it lasts long. I have always been fond of Elizabeth Arden fragrances despite them being very common and aimed at the more mature consumers. Red Door, Provocative Woman and 5th Avenue, are only some of the many fragrances from this house that I adore and that my mother wears well. 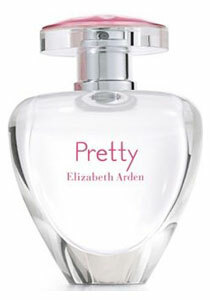 When Elizabeth Arden created Pretty it was obvious that they were intending to crack the younger market. However, with that being said, I would've liked to have seen the company create something unique and refreshing. Pretty is not a terrible scent, and it is likely that many people will buy this fragrance, but I for one will not be buying this. When I first smelt this, it reminded me of another fragrance that I couldn't seem to put my finger on. The reviewer below me suggested that it smelt like Miss Dior Cherie which I somewhat agree with. Perhaps it is a mixture of Miss Dior Cherie with hints of Can Can by Paris Hilton. The scent is indeed sugary sweet and flowery. The middle and base notes of this fragrance are certainly more likable than the top notes, where the peach and mandarin orange notes were far too prominent and strong. I feel as if I'm slightly out of the intended age group for this fragrance as it is a little too innocent and girly for my liking. Teens will probably snap this fragrance up like hotcakes as soon as the price goes down. Overall, the scent is wearable and the lasting power is quite good, but to me Pretty smells like it's trying too hard to emulate other fruity florals on the market today. When a fragrance smells too much like something else it's always a bad sign with me. It smells boring and like a million other pink floral scents. Pleasant and harmless, but boring. PRETTY By Elizabeth Arden FOR WOMEN PERFUME 3.3 OZ EDP SPRAY NEW IN SEALED BOX! There are no member images of Pretty yet. Why not be the first?